Getting to the business end of the season. There are still quite a few spots open for finals so this shapes as a pretty important round. I’ve included some match importance ratings this week so read on to find out which games matter! I posted our simulations earlier in the week - find them here - but it’s safe to say there are some important matchups this week. Last year, I introduce the idea of match importance and I’ll bring it back this week. Below you can see each game ranked by it’s match importance. Essentially this is the sum of the impact a game has on each teams chances of finishing in various finals positions. This weekend we see that St Kilda v Melbourne has the biggest swing - causing a collective 96% swing in top 8 chances for either team! 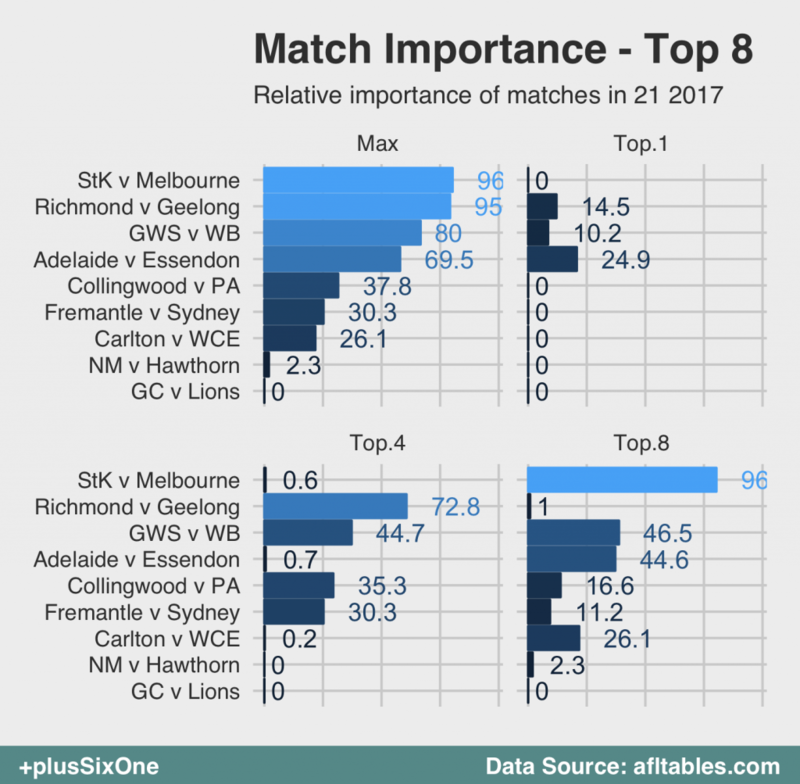 The Richmond v Geelong game has big impacts on Geelong’s minor premiership chances but also both teams Top 4 aspirations. Onto this weeks tips and we can see that some of those important games are quite close in our estimations. The Bulldogs v GWS game, which has huge implications for the Bulldogs finals chances, as well as GWS locking up top 4 or even staying within a shot of a minor premiership. We give GWS a slight edge but, concerningly, all other tippers over on The Squiggle see it the other way! Interestingly, our most important match of the round is also our closest in our predictions! 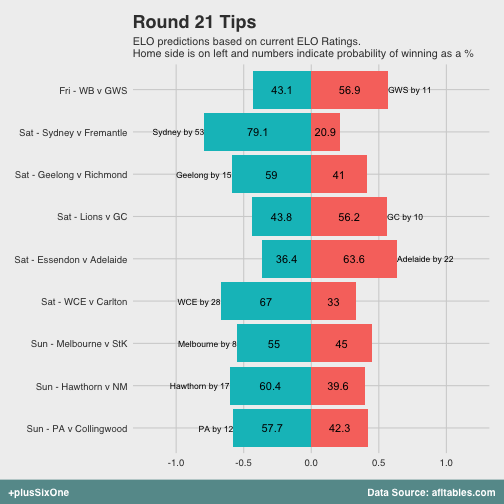 St Kilda v Melbourne has big impacts on both teams finals changes and we are given Melbourne the edge slightly by 8 points, only really due to being the nominal home team.